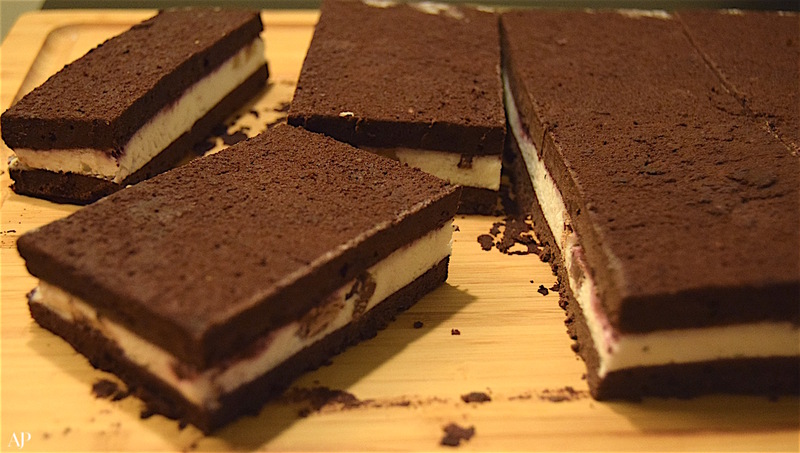 I've always had a soft spot for ice cream sandwiches. My earliest memory of eating ice cream sandwiches was as a kid. My mum would fetch me from school, and on our walk home we would pass a grocery store and I would ask for a 'Max Ice cream Sandwich' and she would buy it for me with disapproving eyes (of course) for 5 rupees at the time. As a child I used to relish that little bar of ice cream and cake until we got home. 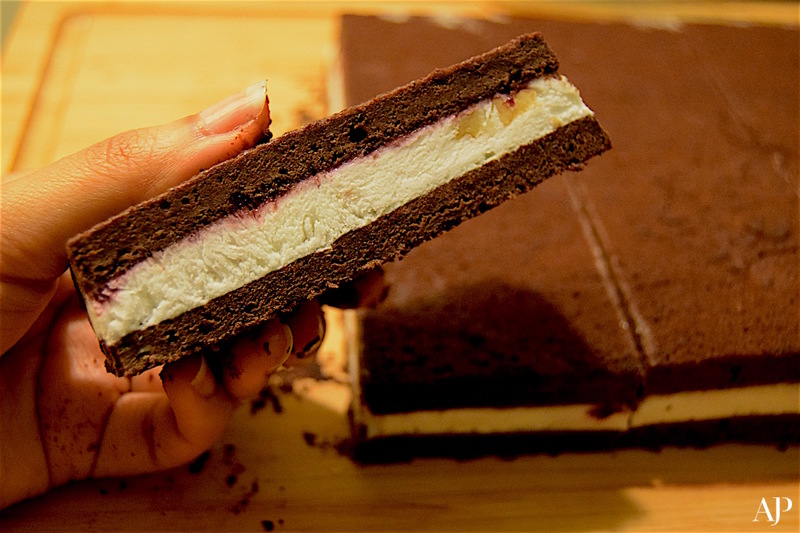 Today I know how to make both cake and ice cream and have combined the two to make a Black Forest–flavoured ice cream sandwich. 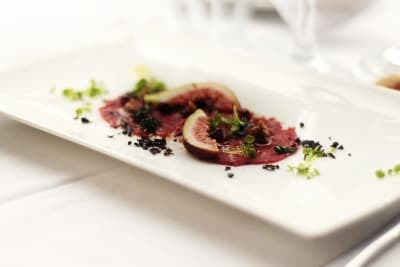 Traditionally, Black Forest consists of a cherry-flavoured brandy called kirsch, however, I have intentionally left it out here to make the recipe kid friendly. I used a mixed berry jam and fresh cherries, but you could use a chunky cherry jam. I also chopped up some walnuts and bits of chocolate for a textural element, but you could leave them out. When deciding on the ice cream to use, I used an organic French vanilla ice cream – the better-quality ice cream you use, the better the final product. I froze my sandwiches for over 24 hours because my freezer works in slow motion! But you probably have to freeze your sandwiches for around six hours before cutting and consuming. This makes these little numbers the perfect make-ahead dessert. Once cut into bars, be sure to wrap them in buttered paper and foil. Tie them up with some cute string and they can become dessert on the go (in case you want to chase your guests out quickly!). In a bowl, cream together the butter and the two sugars until light and fluffy. Add the eggs, one at a time, beating in between each addition. Add the vanilla and mix well. In a separate bowl, sift together the flour, cocoa powder, baking powder and salt. Add the dry ingredients to the wet ingredients by alternating with the milk mixed with the vinegar and instant coffee liquid until you've added everything. Mix well, however, do not over-mix. Line two baking trays (30 x 30cm) with lightly oiled baking paper. Pour half the mixture into one tray and the other half into the second tray. Bake the cake for about 9–11 minutes, or until a toothpick inserted comes out clean. 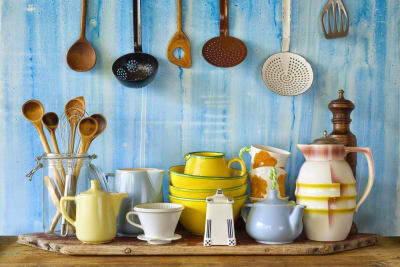 Remove from the trays and leave to cool completely on a wire rack. Keep the ice cream out to soften a little. Remove the baking paper from the sheets of cake and get ready to assemble once cooled. Layer one of the baking trays with cling film and place one sheet of cake on a tray. 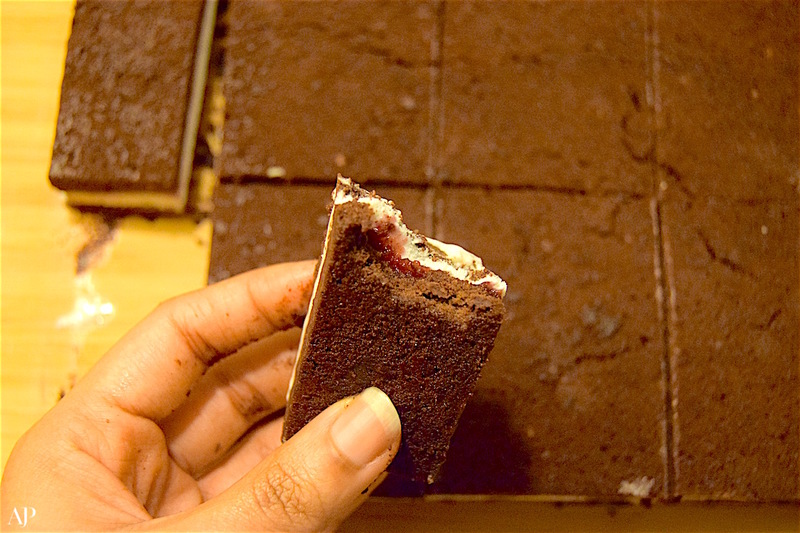 Spread the jam around the entire sheet of cake. Scoop over the ice cream and spread evenly to all the corners, then scatter with the chopped walnuts and chocolate bits. Place the other sheet of cake on top and gently press down. Cover with cling film and foil. Place some weight over the wrapped tray (plates, cans, bottles) and put in the freezer for at least 6 hours before slicing into bars and serving.